Two motorcyclists suffered serious injuries after being involved in a hit and run accident in Homestead. A husband and wife enjoying a ride on a motorcycle when they were hit by a motorist near 137th Avenue and S.W. 288th Street. The woman was run over by the motorist and is in critical condition. If that was not bad enough, the motorist attempted to flee the scene of the accident. Fortunately, they were apprehended in a nearby parking lot, according to CBS Miami. Under Florida Statute § 316.061, fleeing the scene of an automobile collision is against the law and may result in a misdemeanor or felony conviction. Whether someone is charged with a misdemeanor or felony depends on whether the collision resulted in someone suffering an injury or losing their life. In the accident described above, the negligent driver will likely face a criminal felony charge. Keep track of all your medical expenses and lost wages. If you or a family member suffered one or more of the injuries described above, you can pursue financial compensation to compensate you for your damages. You should hire an experienced motorcycle accident attorney who will make sure that you pursue maximum compensation for your medical bills, lost income, any long-term disability, pain and suffering, and other harms and losses. If you lost a family member in a motorcycle wreck, you may be able to pursue a wrongful death claim against the reckless driver and pursue compensation for your funeral costs, burial costs, any medical costs incurred by the victim, lost income, loss of companionship and consortium, and other types of damages. 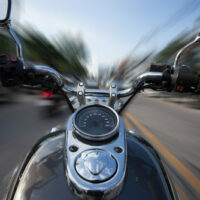 Getting hurt in a motorcycle accident can be a life-altering event. The law firm of Alan Goldfarb, P.A. in Miami understands and is here to assist you during this difficult time. Our law firm has decades of experience and only handle personal injury cases on a contingency fee basis. That means you only pay a legal fee if we get a financial recovery for you.